September 22, 2018 By This post may contain affiliate links. Decorate these insanely creamy mini cheesecakes with chocolate graham cracker crusts to look like the Pumpkin King from The Nightmare Before Christmas movie. 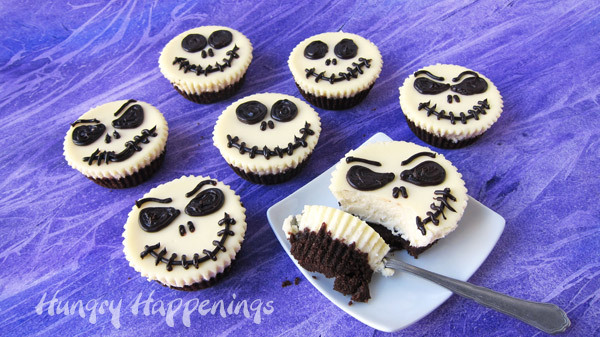 These Jack Skellington Cheesecakes are easy to make using decadent chocolate ganache. Do you love Jack Skellington from The Nightmare Before Christmas movies? He’s a quirky and somewhat creepy character but his look is undeniably perfect for Halloween. 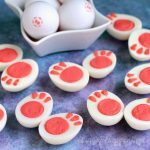 The details of his face are so simple that creating his likeness on a sweet treat like these Jack Skellington Cheesecakes or on Jack Skellington Fudge, or even Jack Skellington Chocolate Bowls is super easy. To make this particular Jack Skellington themed dessert, I started by making a batch of my favorite mini cheesecakes. I swapped out chocolate graham crackers in the recipe for the traditional graham crackers being I wanted a dark colored crust. An OREO Cookie crust would have worked great too. Then I piped some rich and delicious chocolate ganache onto the tops of the cheesecakes to create Jack Skellington’s face which is so express in all it’s simplicity. You can make his eyes big and round and his mouth turned up a in cheeky grin to make him look excited and happy or give him tear drop shaped eyes with dark brows to give him a sinister or scary look. I gave my Jack Skellington Cheesecakes a variety of looks so my Halloween party guests can choose the one they like best. Be sure to give him two nostrils and a mouth that looks like he has been sewn together. Start by making mini cheesecakes on a chocolate graham cracker crust. 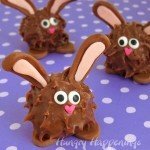 Then decorate them with chocolate ganache eyes, nose, and smiles. Crush chocolate graham crackers using the food processor or by placing them in a zip top bag and smashing them with a rolling pin or the back of a pan. You want the crumbs to be really fine so be sure to break up any larger pieces. Blend the crumbs together with some brown sugar and melted butter. Then spoon about 2 tablespoons of the wet crumbs into muffin tins that have been lined with paper cups. Press the crumbs down into an even layer. I use a pie Stamper to do this which makes this job really easy but you can use your fingers as well. Place cream cheese in a large mixing bowl and beat it until it is really smooth and creamy. For a really smooth cheesecake it is important that you beat the cream cheese until all the lumps of cream cheese are gone. The smoother the better. Then add the sugar and beat until really light and fluffy. Add the eggs and vanilla and stir just until combined then stir in sour cream. I love using sour cream in my cheesecake recipe. It adds to the creamy texture. Place the cheesecake cupcakes into a 350 degree oven and bake for about 15 minutes. You will know your cheesecakes are ready when the center still jiggles but no longer looks wet. Don’t over-bake the cheesecakes as you can ruin their creamy texture. Do I need to bake these mini Jack Skellington cheesecakes in a water bath? No. These cheesecakes are small enough that they will bake through before they can dry out or crack and will still be really creamy as long as you take them out of the oven when they are done. If you want to ensure you have super creamy cheesecakes you can set your muffin tins down into a pan that is filled with some water. Just fill up the pan with boiling water so that the water goes half way up the sides of your muffin tin. Shut the oven door and bake. I personally have baked these cupcake sized cheesecakes many times without a water bath and they have always been really creamy but using a water bath will never be a bad thing. 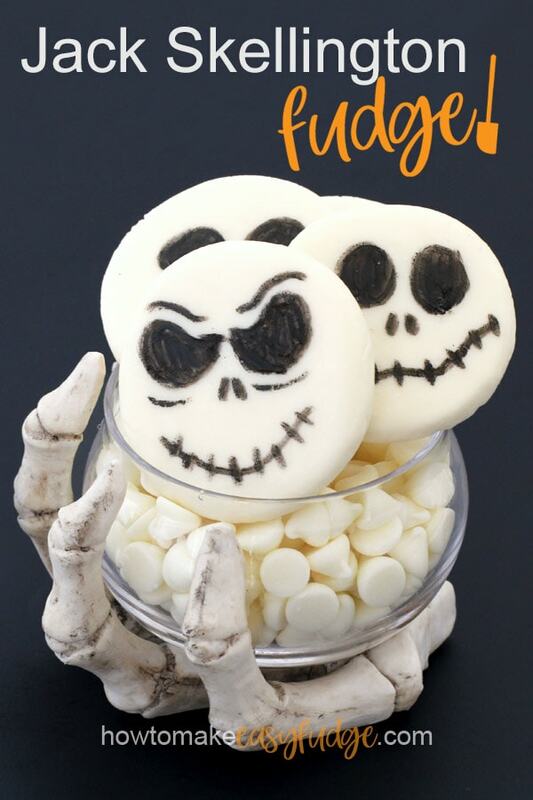 If you decide to make one large 8 inch or 9 inch Jack Skellington Cheesecake you will definitely want to bake it in a water bath and you will need more ingredients than are called for in this recipe. You can use the recipe I’ve used to make my Daisy Cheesecake. If you look at that recipe tutorial you will notice that I color my cheesecake filling and pipe my decoration directly onto the un-baked cheesecake before baking it. The design then bakes right into the top of the cheesecake. 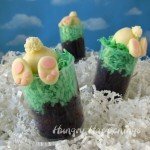 I’ve made a Mickey Mousse Cheesecake, a Painted Pumpkin Cheesecake, a Baby Shower Cheesecake, a Happy Jack-O-Lantern Cheesecake and more using that decorating technique. A large Jack Skellington Cheesecake would look great decorated using chocolate ganache as in this tutorial or using the other method described in all those other tutorials. Should I use paper liners when making these cupcake cheesecakes? Yes, if you want to bake these cheesecakes in traditional muffin tins. 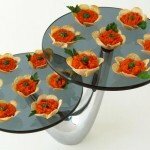 They will be very difficult to remove from a muffin tin it you do not use cupcake wrappers. Once your cheesecakes have baked you will pull them from the oven and let them cool in the pan for at least 30 minutes. Then carefully remove them by lifting up on the paper wrappers. You can leave your cupcakes in the wrappers if you like. 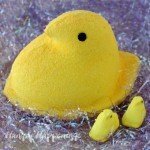 This would be especially helpful if you are going to transport these to another location for a party or bake sale. I wanted you to be able to see the chocolate cookie crust in contrast to the white cheesecake so I peeled my paper wrappers off the cheesecakes. 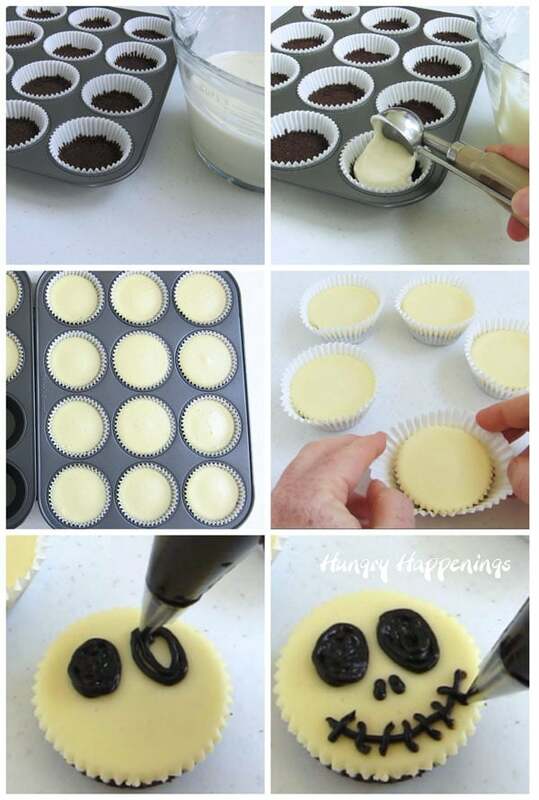 No, if you bake the cheesecakes in a mini cheesecake pan with a removable bottom or in mini springform pans you won’t need to use the paper cupcake liners. There are several different methods you can use to make chocolate ganache. Combine the chocolate and heavy whipping cream in a bowl and heat it in the microwave on high power for 30 seconds then let the bowl sit in the microwave for 3 minutes then remove it and stir until melted. OR combine the chocolate and heavy whipping cream and melt in a double boiler. OR heat the heavy whipping cream either in the microwave or on the stove top just until it starts to bubble the pour over your chocolate, let sit for 3 minutes, then stir until smooth and creamy. You do not want to bring the cream to a full boil you just want to see see bubbles forming around the edge of the bowl or pan. Allow the chocolate ganache to thicken slightly then pour it into a pastry bag fitted with a #3 round pastry tip or into a squeeze bottle with a small opening. Pipe on two eyes near one edge of the round cheesecake. Add two nostrils under the eyes. Then pipe on a smile or smirk and add small stitches across the mouth. How should I store these Jack Skellington Cheesecakes? Store the decorated cheesecakes in the refrigerator for up to 5 days in an airtight container. You can freeze the cheesecakes for up to 3 months. Place a paper towel under the lid of your airtight container then close the lid tight. The paper towel will wick up any condensation in the container so that you don’t end up with beads of moisture on the tops of your cheesecakes. This really helps when thawing frozen cheesecakes. If transporting these cheesecakes I suggest you freeze them and take them out of the freezer, but leave the lid to your airtight container closed. Once you arrive at your destination, you can place the cheesecakes on the dessert table. 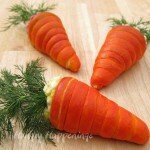 They will thaw in about 20 minutes but will remain cold for longer than they would if you set them out on the table directly from the refrigerator. 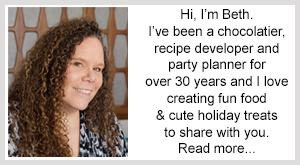 This works great when you are having a party and there will be a significant amount of time between set up and eating the desserts. 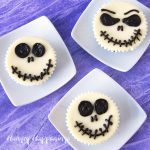 Creamy mini cheesecakes decorated with chocolate ganache to look like Jack Skellington make fun desserts for Halloween. Stir together the chocolate graham cracker crumbs, brown sugar, and melted butter. Press about 2 tablespoons of the crumbs into 18 paper-lined muffin cups. Beat cream cheese on medium speed, scraping down the bowl, as needed, until creamy and smooth. Add egg and vanilla and beat until creamy. Equally divide cheesecake filling among the 18 muffin cups, spooning about 2 tablespoons of filling into each. Bake on the middle rack in the oven for 15-18 minutes until the cheesecakes no longer look wet, but the center still jiggles. Allow to cool for about an hour. Combine chocolate and heavy whipping cream in a small glass measuring cup. Heat in the microwave on high power for 40 seconds. Let the cup sit in the microwave for 3 minutes then remove and stir until melted. If needed, heat for 10 more second bursts of power, stirring after each until melted. Allow this chocolate ganache to cool until slightly thickened. Pour into a pastry bag or squeeze bottle fitted with a #3 round tip. Pipe two eyes, two nostrils, and a mouth onto each cheesecake to make them look like Jack Skellington. Store your cheesecakes in an airtight container in the refrigerator for up to 5 days or in the freezer for up to 3 months. If bringing your cheesecakes to a party and they will sit out at room temperature for a while, I recommend freezing them and transporting them frozen. Once you set them out on the table the cheesecakes will thaw in about 20 minutes and will stay cool longer than if you set our refrigerated cheesecakes. You can definitely do that. Just pipe each name onto the tops of the cheesecakes using the chocolate ganache. 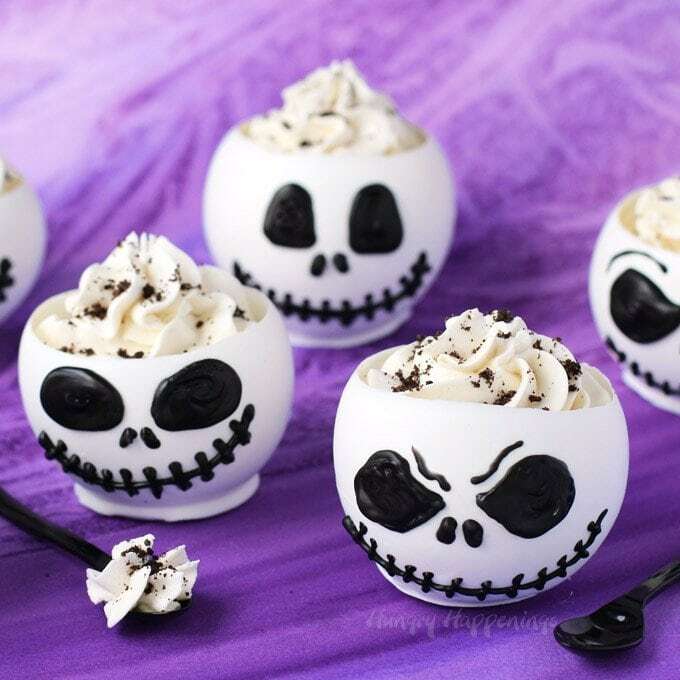 The perfect way to serve a fabulous Halloween Treat! I love this idea, thanks! Thanks Kim! 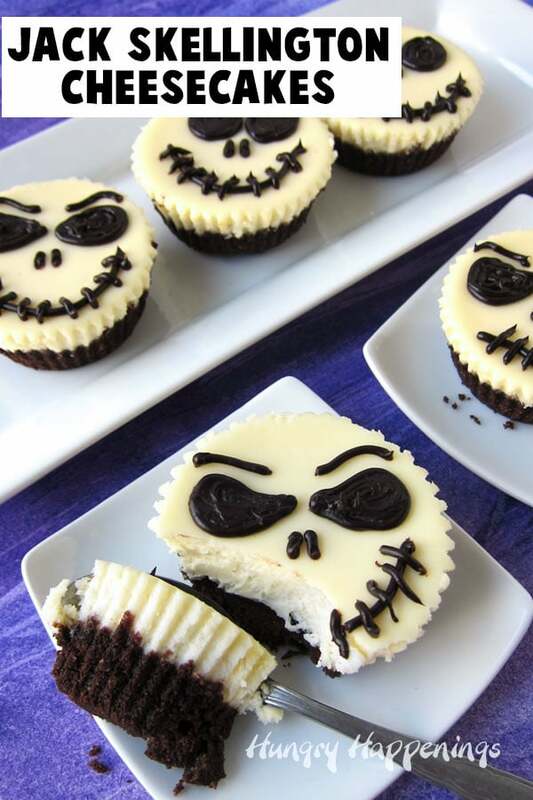 I’m so glad you like these Jack Skellington Cheesecakes. I love this idea! Thank you for sharing! What a perfect recipe for Halloween!